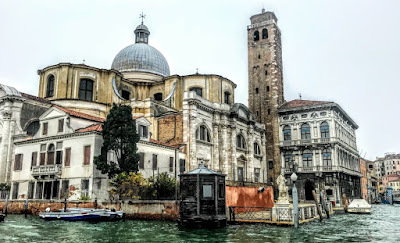 In recent days, I have been discussing how the water bus on the Grand Canal provides a vantage view of many of the finest Gothic, Byzantine-style, baroque and renaissance palaces in Venice. 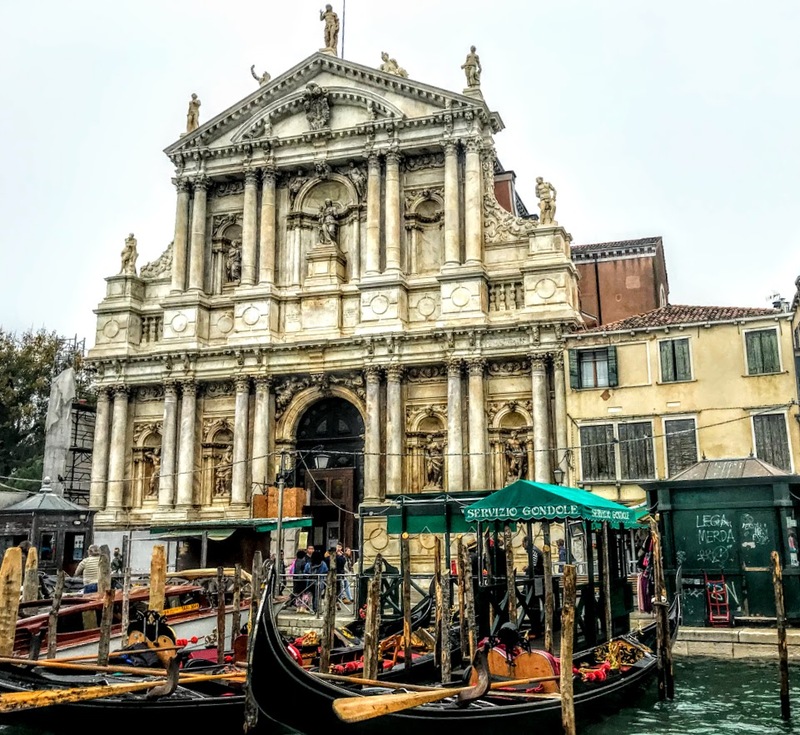 But standing at the back rails of a water bus is also a good way to see many of the finest churches along the Grand Canal. Of course, I visited many of the finest churches in Venice last week, including Saint Mark’s Basilica, the Church of Santa Maria della Salute, and San Giorgio Maggiore. But every twist and turn on the canals, every crossing of a footbridge, and every square and alleyway seemed to bring me face to face with a church of architectural interest and with important works of art by great artists, including Titian, Tintoretto, Tiepolo and Veronese, statues by great sculptors, and shrines with the relics of great saints and martyrs from the past. 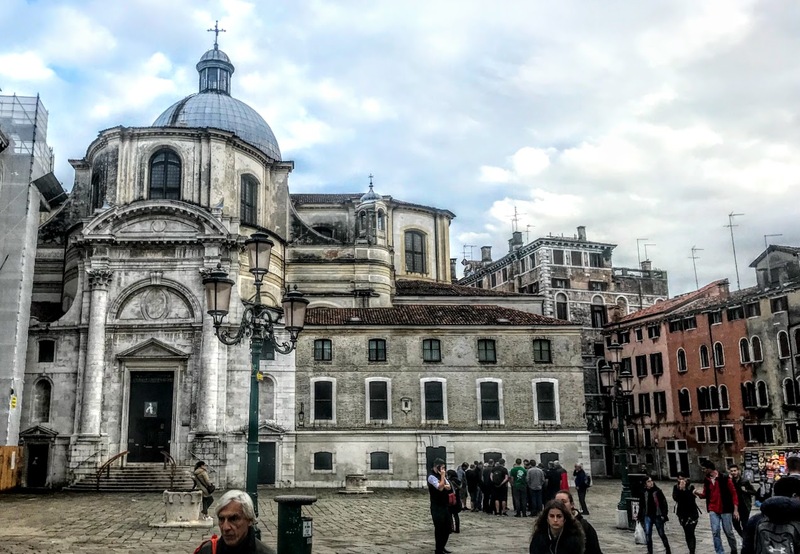 Just a few minutes’ walk from the Santa Lucia train station, the beautiful Church of San Geremia faces onto the Grand Canal, between the Palazzo Labia and the Palazzo Flangini. The church is a popular place of pilgrimage because the body of Saint Lucy of Syracuse is housed here. The first church was built on this site in the 11th century, and was later rebuilt on several occasions. 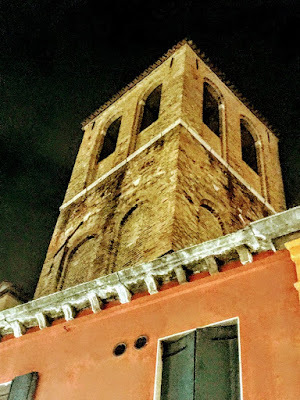 The Chiesa di S. Geremia e Lucia, or San Geremia as it is known, was founded in the year 1000 by a father and son who constructed it to house the arm of Saint Bartholomew. By 1206, the church was housing the body of Saint Magnus of Oderzo, who took refuge in this area from the Lombards and died in 670. The church was first rebuilt by the Doge Sebastiano Ziani, and this new church was consecrated in 1292. The church became the centre of a scandal in 1562 when the priest was accused of heresy and was drowned. The present church was rebuilt in 1753 to designs by Carlo Corbellini, with an imposing dome. San Geremia is unique in having two similar façades, dating from 1861-1871, one facing the Grand Canal and the other, which is also the entrance, facing San Geremia square. The brickwork bell tower, best seen from the Grand Canal, probably dates from the 12th century and has two thin Romanesque mullioned windows at the base. Inside, the altar and the presbytery are notable, with two statues of Saint Peter and Saint Geremia (1798) by Giovanni Ferrari. Behind the altar, a fresco by Agostino Mengozzi Colonna depicts ‘Two Angels upholding the Globe.’ A work by Palma the Younger (‘The Virgin at the Coronation of Venice by Saint Magnus’) decorates another altar. The church also has statues by Giovanni Maria Morlaiter (‘The Madonna of the Rosary’) and Giovanni Marchiori (‘The Immaculate Conception’). 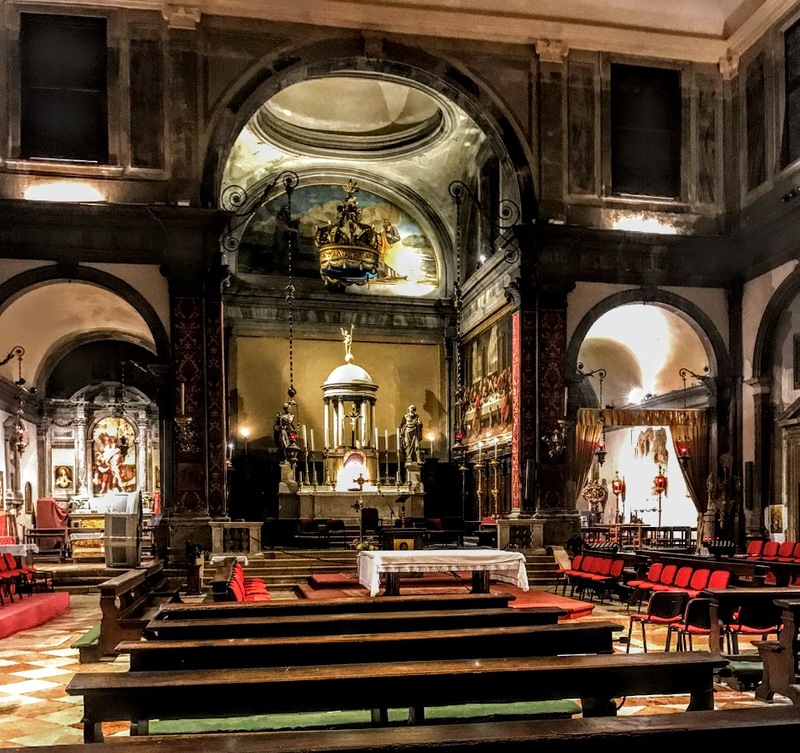 The church is a centre for pilgrimage to the shrine of Santa Lucia di Siracusa or Saint Lucy, a third century martyr from Syracuse in Sicily whose feastday is celebrated on 13 December. She is known to pilgrims as the protector of eyes. Giorgio Maniace, a Byzantine general who captured Syracuse from the Arabs in 1039, brought her body Constantinople. But it was stolen by Venetians who sacked Constantinople during the Fourth Crusade in 1204. At first, her body was kept in the church of San Giorgio Maggiore, on the island of the same name opposite Saint Mark’s Square. Boats carrying pilgrims from Syracuse in 1279 capsized in rough seas, and some pilgrims were drowned. It was decided then to transfer her relics to a church in Cannaregio. 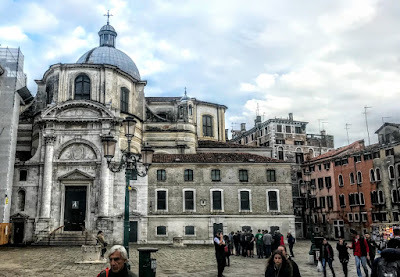 This church was named Santa Lucia and was rebuilt in the Palladian style by Andrea Palladio in 1580. Her body was moved to San Geremia in 1861 when Palladio’s church was demolished to make way for the new railway station. This new train station is still named Santa Lucia. The Patriarch of Venice, Angelo Roncalli, who later became Pope John XXIII, had a silver mask placed on the saint’s face in 1955 to protect it from dust. 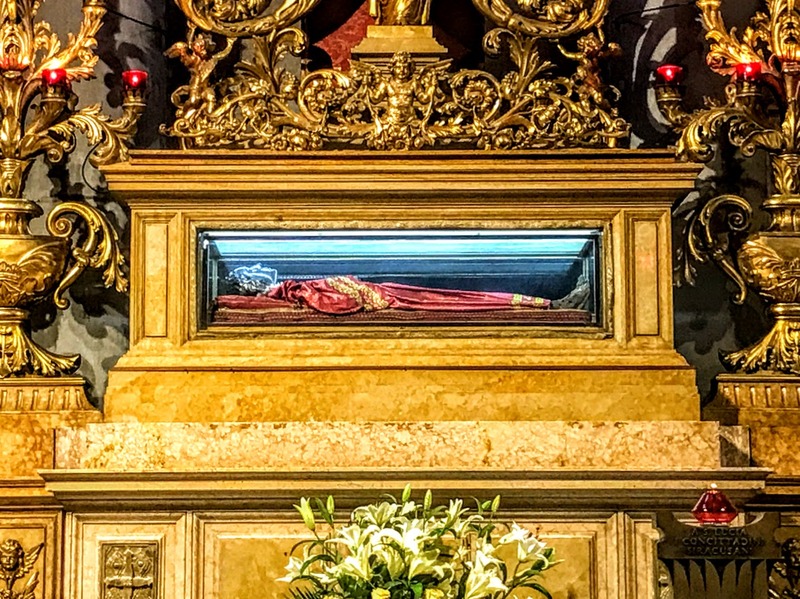 The saint’s body, once stolen in Syracuse in 1039 and again in Constantinople in 1204, was stolen a third time in 1981, this time when two armed criminals forced the main doors, entered the church and smashed the glass of the shrine holding her body. In their confusion, the thieves left behind her head and the silver mask. They demanded a ransom, but local police retrieved her body in the lagoon area of Montiron and she was returned to the church on her feastday, 13 December. Although she has been in Venice for many centuries, the city of Syracuse where she was born still claims her body. 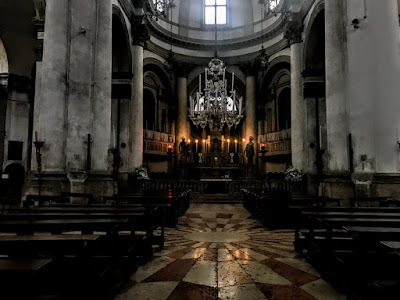 One of the oldest churches in Venice is the Chiesa dei Santi Apostoli di Cristo (Church of the Holy Apostles of Christ), known as San Apostoli, a seventh-century church on the Campo dei Santi Apostoli. Venice was not yet a city in the seventh century, but was a collection of small communities scattered throughout the lagoon. San Magno (Saint Magnus), Bishop of Oderzo, came to the lagoon and founded eight churches. According to legend, he had a vision of the Twelve Apostles telling him to build a church at a place where he saw 12 cranes, and this location became the site of San Apostoli. The church is notable particularly for the Cornaro Chapel, an important example of Early Renaissance architecture, added by the architect Mauro Codussi in the 1490s. At the same time, Codussi oversaw the addition of a porch to the front of the church, the building of a sacristy, and other alterations. The Cornaro Chapel was the burial place of several members of the Cornaro family, including Giorgio Cornaro and his sister Catherine Cornaro. Queen of Cyprus and Armenia, although her body was later moved to the Church of San Salvadore. The main altar of the chapel was the Last Communion of Saint Lucy (1747-1748) by Tiepolo. The charity Save Venice funded the restoration of the chapel, including the relief carvings. 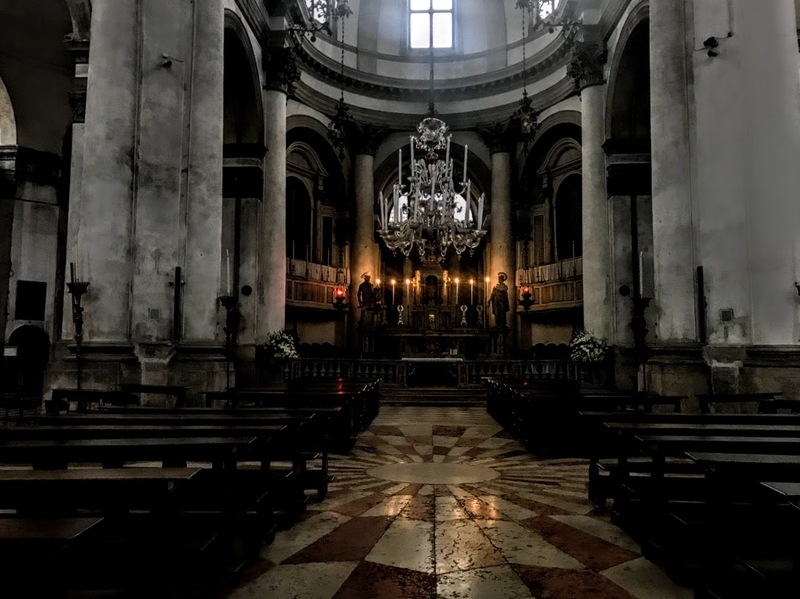 In the mid-16th century, the church briefly housed the Catecumeni, a Venetian fraternity for people preparing to convert to Christianity, before moving to San Gregorio in 1571. The church was completely rebuilt in 1575, with only parts of the earlier structure retained, including some frescoes and the Cornaro Chapel. In the early 18th century, Andrea Tirali added details, including the onion dome, to the campanile, which was a late 17th-century addition. The church retains its 16th century layout: a single nave supported by two rows of columns. One chapel has the funeral monument of Count Giuseppe Mangilli, designed by Luigi Trezza with a bust by Angelo Pizzi. The main altarpiece is a Custodian Angel by Bernardo Strozzi. The church houses several works of art, including works by Giambattista Tiepolo and Paolo Veronese. The ceiling paintings by Fabio Canale include ‘The Communion of the Apostles and Exaltation of the Eucharist,’ and the Four Evangelists. The paintings in the church include: Paolo Veronese, ‘Gathering of Manna’ (1580-1585); Cesare da Conegliano, ‘Last Supper’ (1583); Giovanni Contarini, ‘Birth of the Virgin’ (1599); Fabio Canal, ‘Communion of the Apostles and Exaltation of the Eucharist’ (17th century); Giambattista Tiepolo, ‘Last Communion of Saint Lucy’ (1747-1748); and Sebastiano Santi, ‘Christ between the Apostles’ (1828). 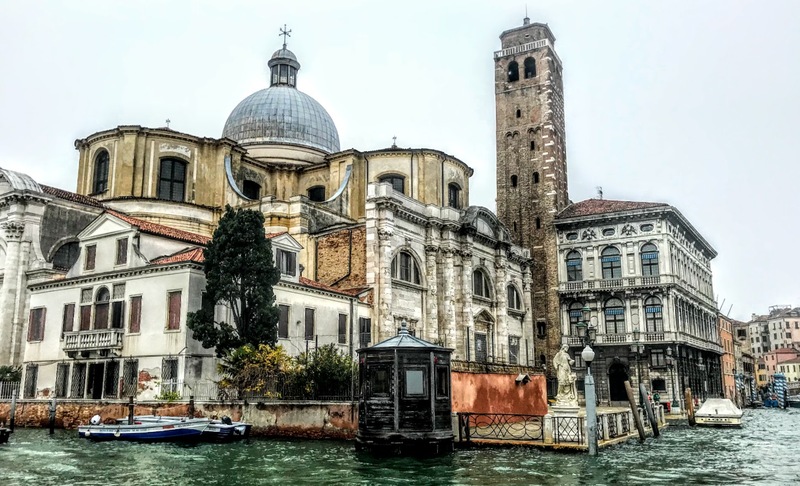 Nearby, the Church Santa Sofia can be found near the traghetto or gondola ferry of Santa Sofia on the Grand Canal. A wooden church dedicated to Sant Sofia or the Wisdom of God was noted in Venice as early as 886. A new church was built in the 11th century through the patronage of the Gussoni family. Building work began in 1020, and this church appears to have survived the great fire of 1105. Major rebuilding took place in 1507-1534, and the architect Antonio Gaspari designed another reconstruction in the late 1600s. When the Strada Nova was laid out in the 1800s, the church was shortened in length. Then, when Napoleon captured Venice, this was one of the churches here celebrations of the liturgy were suppressed. The church was converted into a warehouse and its contents were dispersed. The church has lost many of its original art works and paintings, including ‘The Last Supper’ by Paolo Veronese, ‘The Birth of the Virgin’ by Titian, ‘Christ preaching to the Masses’ by Francesco da Ponte, ‘The Crucifixion’ by Tintoretto, ‘The Marriage of the Virgin’ by Tintoretto, and paintings attributed to Francesco and Leandro Bassano and Jacopo Palma the Elder. These works are now in the Gallerie dell’Accademia. 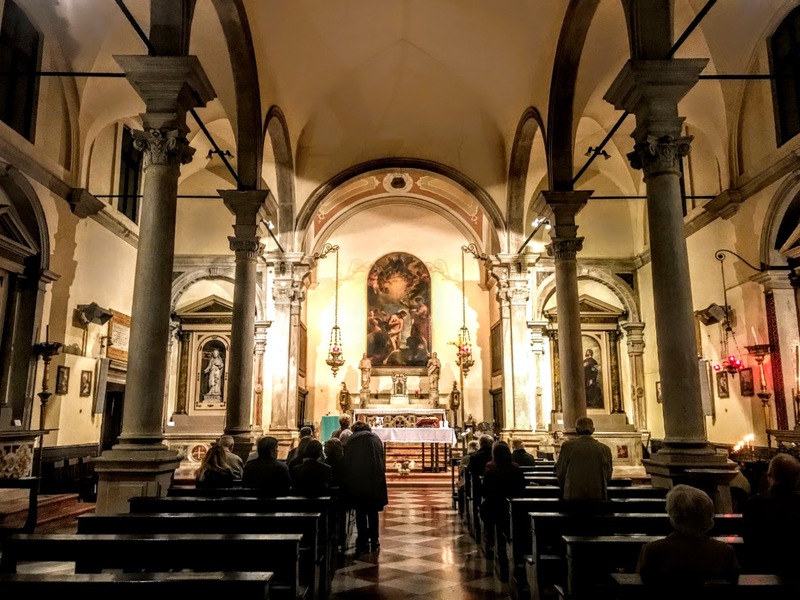 The church now has two paintings by Bassano’s school at the side of the presbytery, and ‘The Baptism of Christ’ by Girolamo Heinz above the main altar, as well as four statues of saints, attributed to Antonio Rizzo. The church was bought back in 1836, it was cleared of debris, and the church was re-consecrated. However, the ground floor of the façade and bell tower of the church are screened behind the buildings on the street front, making it easy to pass this church without noticing it, and the entry to the church is through what looks like a shop door. At the end of my journeys along the Grand Canal last week, I reached the Church of Santa Maria di Nazareth, known locally as the Church of the Scalzi, or simply as ‘Scalzi,’ beside Santa Lucia railway station. The ashes of Ludovico Manin, the last Doge of Venice, are buried here. This late 17th-century Baroque jewel of Venice was designed by the architect Baldassare Longhena, whose splendid façade is decorated with statues that attract the attention of every passer-by. The facade in Venetian Late Baroque style was financed by the aristocrat Gerolamo Cavazza, and erected by Giuseppe Sardi in 1672-1680. The four statues in the first order, the Virgin Mary and the Christ Child, Saint Catherine of Siena and Saint Thomas Aquinas were sculpted by Bernardo Falconi. The first chapel to the right has a statue of Saint John of the Cross, attributed to Falconi. The statues of Faith, Hope, and Charity are by Tommaso Rues. The third chapel on the left has a statue of Saint Sebastian (1669) with bronze bas-reliefs also attributed to Falconi. 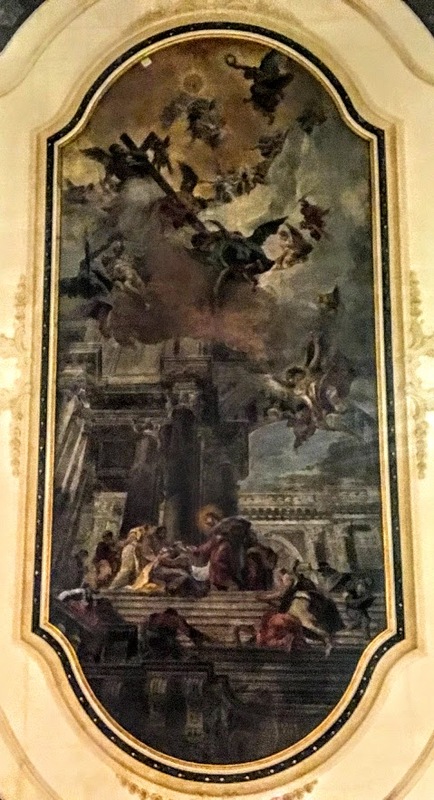 The vault of the nave once housed a major fresco by Tiepolo depicting the ‘Translation of the House of Loreto.’ Tiepolo had worked in the church, decorating the vaults of the Chapel of Saint Teresa (1727-1730) and the Chapel of the Crucifix (1732-1733). However, the frescoes were destroyed by an Austrian bombardment on 24 October 1915. The remains of the fragments of Tiepolo’s work are now in the Gallerie dell’Accademia. I spent much of yesterday in Killaloe, Co Clare, taking part in meetings of the joint chapter of the three cathedrals in this diocese: Saint Mary’s Cathedral, Limerick, Saint Flannan’s Cathedral, Killaloe, and Saint Brendan’s Cathedral, Clonfert, Co Galway. Most Anglican cathedrals have a precentor whose role is traditionally related to the organisation of liturgy and worship. In many cathedrals of the Church of England and the Church of Ireland, the precentor was traditionally a residentiary canon or prebendary, and was often assisted by a succentor, particularly in the daily task of leading choral singing. The word precentor comes from the Latin praecentor, from praecinere, to sing before, lead in singing, or from the Latin preces cantor, the singer of the prayers. There are different uses of the term precentor in other faith traditions. Jewish precentors, like cantors, are song or prayer leaders, leading synagogue music. In many churches in the Presbyterian churches tradition, where worship follows the tradition of singing a cappella, the precentor leads the singing, often by means of conducting techniques, but sometimes just by singing from within the congregation, and is not normally an ordained person. In Church of England cathedrals of the ‘Old Foundation, the precentor is a member of the cathedral chapter and officially ranks next to the dean. His or her musical duties are often performed by the succentor, one of the vicars choral. In cathedrals of the ‘New Foundation,’ the precentor is not a member of the chapter but is one of the minor canons. This includes Canterbury Cathedral and Westminster Abbey, where the Precentor is a minor canon, and therefore part of the Foundation, but not part of the Chapter. Traditionally, the precentor’s stall in an Anglican cathedral is on the opposite side of the quire from that of the dean, leading to the traditional division of the singers into decani or the dean’s side, and cantoris, the precentor’s side. In the Church of Ireland, the two cathedrals in Dublin, Saint Patrick’s Cathedral and Christ Church Cathedral, the precentors – Canon Peter Campion and Canon Roy Byrne – work well with the traditional understanding of the role of the precentor, and in the past Canon Bob Read was virtually a full-time residentiary precentor in Saint Patrick’s Cathedral. But in other dioceses and cathedrals in the Church of Ireland, the Precentors often overlap with roles in their associated cathedrals, if only to effect a unified chapter. For example, in the neighbouring diocese of Cashel, Ferns and Ossory, the Precentor of Cashel is the Dean of Waterford, the Precentor of Waterford is the Dean of Lismore, the Precentor of Lismore is the Dean of Waterford, the Precentor of Ossory is the Dean of Ferns, the Precentor of Leighlin is the Dean of Ossory. Similarly, Precentor of Cork is the Dean of Cloyne; the Precentor of Kildare is the Dean of Clonmacnoise (Saint Patrick’s Cathedral, Trim). In Lichfield Cathedral, Canon Andrew Stead is Canon Precentor and holds responsibility for the cathedral’s worship, music, and for the way in which the Cathedral seeks to build up its communities in faith, knowledge and understanding. The Chancellor’s roles are in education and outreach, and the Treasurer has oversight of property and fabric. In Wells Cathedral, the Precentor is also the Prebendary of Whitchurch – just as in the Chapter of the three cathedral in this diocese the Precentor is also the Prebendary of Ballycahane. The Precentor’s role in Wells involves the oversight, planning and direction of the cathedral’s daily round of worship as well as the many special services throughout the year. The Precentor also oversees the Music Foundation on behalf of the chapter, working closely with the Cathedral musicians, for whom he also has pastoral care. In Durham Cathedral, where they are appointing a new precentor, the precentor attends monthly chapter meetings, informal meetings with senior colleagues three or four times a year to discuss wider strategy, and an annual 48-hour residential conference. There are termly meetings of the Chorister School governing body, of which Chapter members are by statute ex officio members. The Canon Precentor chairs the Worship, Music Outreach, Diary and Corporate Safeguarding (Management) Committees, and is expected to attend the annual College of Canons meeting and sub-committees of the Chorister School. As a residentiary canon, the Canon Precentor attends meetings of the Fabric Advisory Committee, and is eligible to sit on other cathedral and diocesan committees or bodies, such as the review of diocesan support for liturgy and the Diocesan Safeguarding Board. Beyond the governance role as a member of chapter, the Canon Precentor is a key leader within the cathedral, taking an executive role in leading and managing Heads of Department. • Lead on all aspects of liturgy and music, including the line management of the Precentorial Department, Master of the Choristers and Head Verger. • Lead the Cathedral in achieving its strategic goals of developing both traditional and innovative forms of worship and extending its engagement through worship. • Act as ‘Custos’ of the Chorister School, being the first point of contact for day-to-day liaison with the school community, line managing the Headmaster and offering pastoral care to staff and pupils. • As Vice-Dean, elected annually by Chapter, act in all things in the absence of the Dean. • Lead on parish Patronage and charitable giving; oversight of all groups supporting regular and special services. • Develop areas of strategic leadership or involvement in ministerial formation. The Canon Precentor carries out canon-in-residence duties in the daily offices for periods of a week or a fortnight at a time, up to 13 weeks a year. All residentiary canons share this responsibility, which the canon-in-residence leads, as well as preaching at Matins on the Sunday of his/her residence cover. In case of need, the Dean and other canons are always ready to cover for one another. The Canon Precentor is fully involved in the liturgical life of the cathedral, including regular Sunday celebrations, presiding at weekday Eucharists and preaching. The rotas are drawn up well in advance, and where possible external invitations, especially in the Diocese of Durham, are supported. Residentiary canons will normally attend the daily offices as part of their commitment to corporate worship. This paper was prepared for a meeting in Saint Flannan’s Cathedral, Killaloe, of the joint chapter of Saint Mary’s Cathedral, Limerick, Saint Flannan’s Cathedral, Killaloe, and Saint Brendan’s Cathedral, Clonfert.